To use LR/PhotoDeck you need to choose the images to send. Go to the Library module, select the images that you wish to send and then press the Export button. From this panel you can choose to upload to either a collection a gallery, and you may also create these if you wish to. LR/PhotoDeck keeps track of which images have been previously uploaded. By default, if you upload an image for a second time it will overwrite the image on the server to that you don't end up with multiple versions. Only the image data is overwritten, so if you have previously assigned the image to various galleries and collections then these assignments will be preserved. 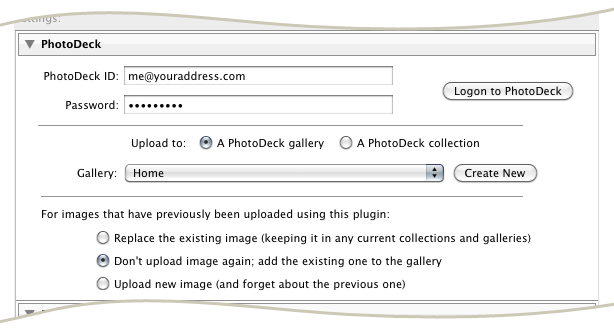 By choosing "Don't upload image again" LR/PhotoDeck will simply assign the image on the server to the gallery or collection that you have selected. Once you're ready, press "Export" to upload your images.